Set-Up --- It's All Done! As I was drilling the 5/16" hole in the center of the end wedge, for the end pin, I guess I wasn't thinking too carefully, because I forgot to cover the area with masking tape. Thus, as I was drilling — or maybe it was as I was backing the drill bit out — I managed to chip-out a triangular piece of the end wedge (about 1/4" wide by 3/8" long), right below the drilled hole. YIKES!!!! MY BEAUTIFUL END WEDGE RUINED!!!! I was devastated. But I recovered (though I still felt awful about it). 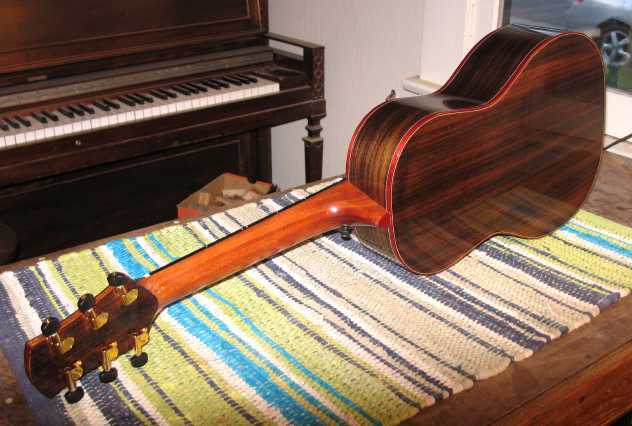 At least the chip-out didn't touch any of the purfling — it was just a piece of the bloodwood binding I'd glued together. SO....I decided to try to repair it. I used a small gouge to give the chipped-out hole somewhat of a shape, and then used the gouge to shape a piece of scrap bloodwood binding. I superglued it into the hole (it extended higher than the hole), held it there a while, and then sanded it down flush. I then proceeded to totally refinish that end wedge area — leveling it a bit and brushing on around 3 coats of the finish. I let it sit overnight. 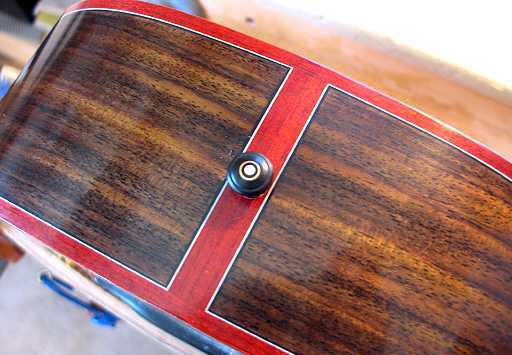 I'll say one thing about the EM6000 finish — it sure makes doing repairs or refinishes easy!!! 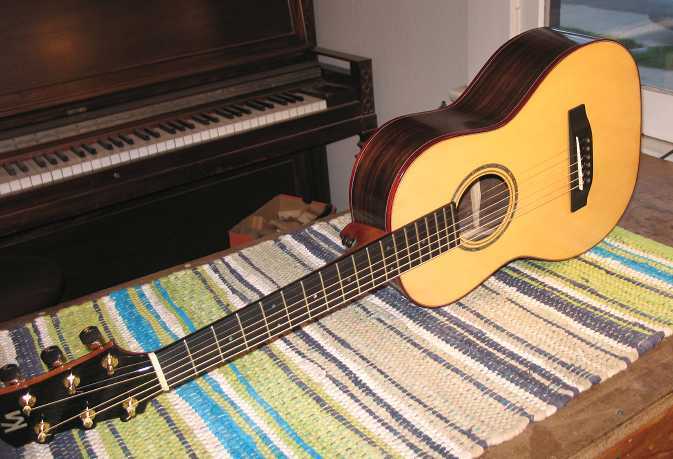 With the few sand-throughs I've done on this guitar, and with this major boo-boo, this finish worked beautifully — it sands and levels easily and smoothly and blends right in with the surrounding areas. Thank goodness for that!!! Now, with that out of the way, I moved on to the main job for today — the set-up! The first thing I did was to drill the bridge pin holes and saw out the little string slots in the holes. Last night I had prepared the nut and saddle, so those were ready. 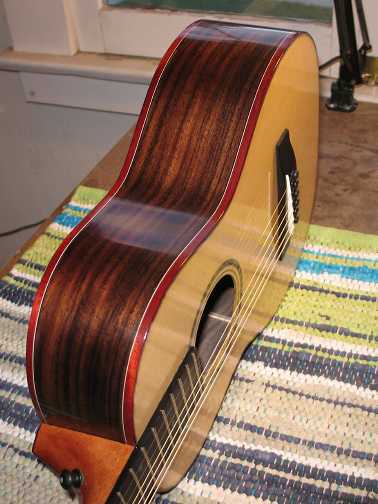 I sawed string slots in the nut and strung up the guitar. 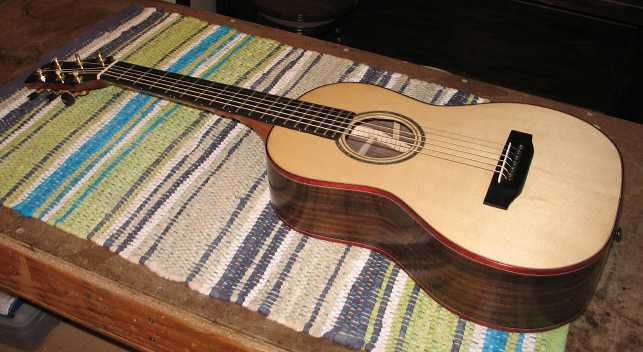 Once the nut slots seemed right, I checked for the action at the 12th fret. I was shooting for 6/64" space between the low-E string and the 12th fret, and 4/64" between the high-E string and the 12th fret. 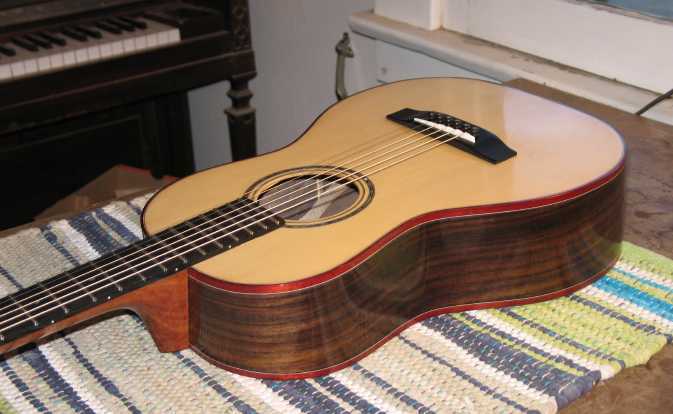 I determined how much I had to remove from the bottom of the saddle (for example, at the low-E part of the saddle, you remove twice the amount of extra space over the 6/64" you have under the 12th fret). I then sanded that much off the bottom of the saddle. When I tried the saddle out, however, it turned out I took too much off the bass side of the saddle — the low-E string buzzed, but all the other strings were fine. So...I ended up shimming the saddle at that end by gluing another wedge-shaped shim of bone to the bottom of the saddle. By trial and error, I finally got it to work. I decided to try out Elixir Polyweb extra light strings on this one. I think I like them! Oh, yeah — the final thing I did was to install a strap peg on the heel.